Researchers with the U.S. Department of Energy’s Lawrence Berkeley National Laboratory (Berkeley Lab) have created a graphene and tin nanoscale composite material for high-capacity energy storage in renewable lithium ion batteries. By encapsulating tin between sheets of graphene, the researchers constructed a new, lightweight “sandwich” structure that should bolster battery performance. Graphene is a single-atom-thick, “chicken-wire” lattice of carbon atoms with stellar electronic and mechanical properties, far beyond silicon and other traditional semiconductor materials. Previous work on graphene by Zhang and his colleagues has emphasized electronic device applications. In this study, the team assembled alternating layers of graphene and tin to create a nanoscale composite. To create the composite material, a thin film of tin is deposited onto graphene. Next, another sheet of graphene is transferred on top of the tin film. This process is repeated to create a composite material, which is then heated to 300˚ Celsius (572˚ Fahrenheit) in a hydrogen and argon environment. During this heat treatment, the tin film transforms into a series of pillars, increasing the height of the tin layer. “The formation of these tin nanopillars from a thin film is very particular to this system, and we find the distance between the top and bottom graphene layers also changes to accommodate the height change of the tin layer,” says Liwen Ji, a post-doctoral researcher at the Foundry. Ji is the lead author and Zhang the corresponding author of a paper reporting the research in the journal Energy and Environmental Science. 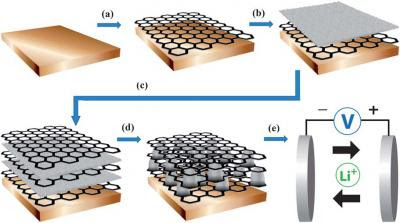 The change in height between the graphene layers in these new nanocomposites helps during electrochemical cycling of the battery, as the volume change of tin improves the electrode’s performance. In addition, this accommodating behavior means the battery can be charged quickly and repeatedly without degrading — crucial for rechargeable batteries in electric vehicles.